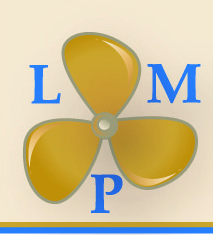 Welcome to the`LEITRIM MARINE PROPELLERS`website. 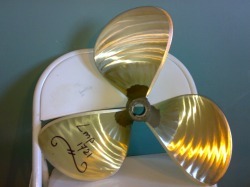 Leitrim Marine Propellers provides a prompt repair service for bronze propellers. 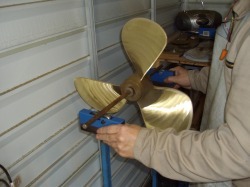 A courier can collect your damaged propellers,we restore them in our purpose-built workshop, equipped with custom made instruments. 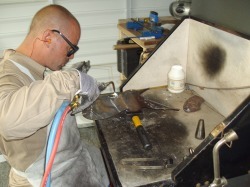 Each job is stamped with a unique number and returned with an individually prepared measurement report. 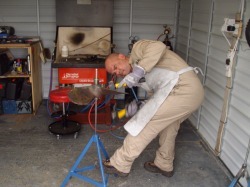 Every stage of the repair process (illustrated below) is in the skilled hands of Tino Deijkers, who has years of experience working to the exacting standards of the busy Dutch company: Van Ballegooij Shippropellers in Moerdijk. 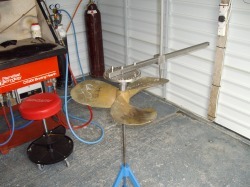 Although he has repaired propellers measuring 9 feet, the maximum size we currently handle is app. 25 inches. 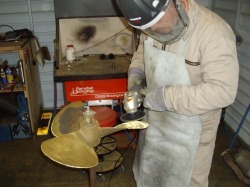 We also undertake specialised custom adjustments of propeller diameter, pitch and blade thickness. See next page for pricelist of repairs and pitch-corrections.